An ENERGY STAR® certified heat pump water heater is the most efficient way to heat hot water with electricity and is the most climate-friendly form of water heating available in BC. 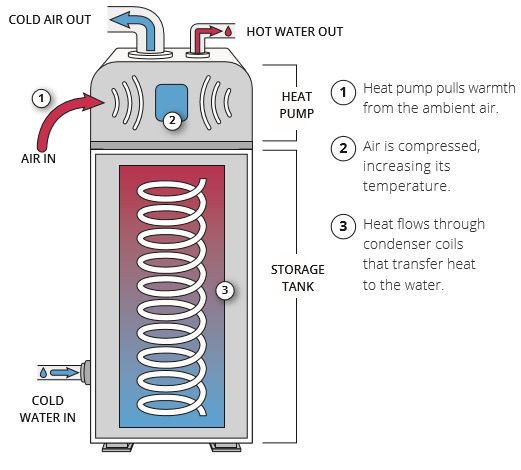 A heat pump water heater takes heat from one place and moves it to another by compressing and expanding refrigerant. To heat water, the heat pump pulls warmth form the ambient air by compressing the air to increase its temperature. The heat flows through a condenser coil inside the hot water system to transfer heat to the water. Some models have a backup electric heat element to help during periods of high use.